If you're looking for something tangible, easy and fun to do to help families grow in their faith this Easter season, check out these Easter Family Devotions boxes! They are easy to put together in bulk and hand out to every family in your church. They come with instructions for 14 devotions, with an object for each one. It also comes with a shopping list (with amazon links! ), printable customizable sticker labels and graphics, printable customizable devotional cards, and instructions for this project. This is the perfect way for churches to partner with families this Easter season and empower parents to lead their kids spiritually. It's a great way to remind kids of the true meaning of Easter so families can grow in their faith together. Each devotional includes a Scripture passage, an object, and discussion questions. It walks families through the Easter story. Objects are a tangible hands-on way for kids to learn and reinforce Bible stories. These boxes are easy to assemble and the devotions are fun and easy for families to do! I encourage you to pass these out to families in your church between 1-8 weeks from Easter. This is a downloadable product; it does not include the objects needed for the devotionals, but it does include Amazon links to purchase them. Get this kit for only $10 here. There's a saying that it's easier to retain than to recruit volunteers, and it has a lot of truth to it. Part of children's ministry is ALWAYS going to include recruiting volunteers, and recruiting needs to be constant. But a big part of leading children's ministry is retaining your current volunteers. If you are constantly seeing volunteers come in and others go out the back door, you will have to work MUCH harder. But if you can figure out how to keep the majority of your volunteers, AND constantly recruit new ones, it won't be long before you are fully staffed in some areas, and maybe even have a waiting list for volunteers! Leading, developing and caring for volunteers is one of my passions. They have to know that we don't just want to use them as a warm body doing a job; we want more FOR them than from them. As a leader, make sure you know and care about your volunteers personally. People can tell when you just want to use them and get them to do something for you, versus when you want to build relationships with them, serve them, and help them grow. Provide opportunities for them to grow as leaders in ALL areas of their lives. Make sure they are serving in their sweet spots and using their gifts, and that you are identifying people with more potential; then provide a leadership pipeline with with opportunities for them to move up and grow as leaders. Give them ownership instead of just tasks. Give them decision making roles and allow them to take real leadership. People will step up to the role you give them, and if you give them small jobs and small roles, they won't feel necessary, and you will end up losing your volunteers. One of the awesome things we do at 12Stone is create a coaching structure to make sure all the volunteers are cared for and invested in. When you have 10 volunteers, you can care for all of them yourself.... but if you want more volunteers, you need to expand your leadership structure. We have over 100 volunteers on each of our department teams, and in order to care for all of them, we need volunteers caring for and leading other volunteers. We have a position called volunteer coach, and this person has 10 people in their small group. They lead weekly huddles, reach out to their volunteers outside of church, encourage them, influence them, pray for them and pour into them, plan fun events for them outside of church to build community. I meet with my coaches monthly as a group and individually and pour into them, and they lead their small group. That is one way to help make sure none of the volunteers slip through the cracks, with no one caring for them. They build community in their small groups, and if someone goes through a hard life situation or family emergency, the coach and small group is there to reach out and care for the people on their team. This is huge- I would not skip this in children's ministry. Helping build intentional coaching structure is vital for building healthy volunteer teams. An important aspect of keeping current volunteers is providing clear communication and organized leadership and structure in your ministry. Nothing is more frustrating for volunteers than a leader who doesn't communicate, who isn't on top of things, and isn't prepared and doesn't listen to them. Be a good listener, take their feedback seriously. Make sure you have everything ready for them on Sundays and the policies and procedures and job descriptions are clear. Provide ongoing training for them regularly and opportunities for them to give feedback. We do annual large group "training" sessions that are similar to children's ministry conferences, as well as weekly on site training through Huddles before service, and ongoing opportunities for leadership development. It's easy for people to serve every week and lose sight of the big picture of why we do what we do- what our mission is, and what a win is in our ministry. When that happens, you lose volunteers. Your job as a leader is to continually keep the vision and the mission in front of your leaders. You cannot over communicate the vision and the value of children's ministry. You should be sharing stories of life change and sharing your goal and what a "win" is on a regular basis. Encourage and show appreciation to your volunteers. Make sure you celebrate with them when you see them working hard and going after big wins. If you do those 4 things well, you will see great retention in your volunteer teams. We ask all of our volunteers to serve every Sunday, and not just for a certain amount of time- it's until they step down. But we have a surprising number of volunteers who serve regularly for long periods of time- years even, because they are sold out to the ministry and they are being invested in, and they are making a HUGE difference for the kingdom of God. We don't do it perfectly every time, but when you make the effort to do these 4 things with excellence, you will see a big dividend in people invested in your ministry for the long term. For the last 8 months, I have focused my ministry on preschool (ages 2-5), and I now have a new appreciation for not only this age group, but for the huge potential of life change through preschool ministry. Many people start coming to church (or coming BACK to church) when they have young kids. If their kids are safe and having a great time and learning and growing, people will want to stay at a church. If their kids dislike church, young parents won't be likely to stay. It's easy to think of preschool ministry as simply "babysitting," but I see a bigger picture: I see a vision of little children worshipping freely and getting their first glimpses of what it means to follow Jesus. I see kids learning the foundational biblical truths that they will build on and plant seeds in their hearts for the rest of their lives. I see a place where kids can wiggle and run and laugh and feel loved and accepted, all while being pointed to Christ in every aspect. Preschool ministry is SO much more than just babysitting. It is one of the most important ministries in a church, and one that often gets pushed to the back burner. If churches can grasp the importance of reaching young kids and their parents, they will experience growth and church health, and they will see young parents flock to their church. Preschool ministry builds a foundation of faith and trust in the church in young kids, a foundation that is built stronger in elementary ministry, and stronger in student ministry. If we can be intentional to reach kids and impact them through key milestones and moments in their lives, and partner with parents to build a strong faith from the very beginning, we can make a bigger impact and grow disciples that stick with their faith. SAFETY: For most of my 12 years in children's ministry so far, I have focused mostly on Elementary Ministry. While elementary ministry must have safety policies and procedures in place, it is EVEN MORE VITAL to have simple, yet comprehensive, and enforced safety policies in preschool ministry. There are even more risks, with things like diaper changes and potty accidents, injuries, sippy cups and germs, snacks and allergies, crying children, cleaning toys, check-in and check-out, and moving rooms if you move from small group to large group. There are more things to think about in preschool ministry when it comes to safety, and it is absolutely essential to have leaders who know and enforce all the safety policies and procedures. It took me a few months to completely understand and wrap my mind around the differences in preschool vs. elementary policies, and now I am even more convinced that this is important in a great preschool ministry. SHORT ATTENTION SPANS AND FUN: Preschoolers have even SHORTER attention spans than elementary aged kids. This can he a big challenge when it comes to engaging them in activities and curriculum, and because of this, many people in preschool ministry almost "give up" and just let kids have free play for most of the worship hour. But I look at it as an opportunity for us as leaders to sharpen our skills and look for fun and creative ways to keep kids engaged from the time they enter the rooms until they go home. 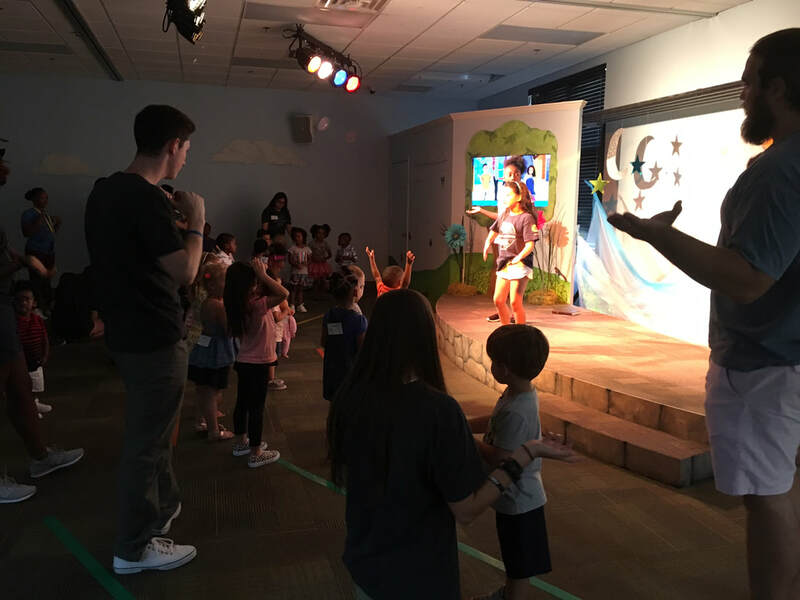 We can play games, use puppets, do fun crafts, have snacks, sing songs, and do all kinds of fun activities to help connect kids to God. Everything we do can help point them to the Lord and His love. I love working with my volunteers to find fun ways to engage kids, even as young as two years old, and help them have fun while learning. We do a large group worship services for our preschoolers, as well as small group time in classrooms. You can be as silly and funny as you want with preschoolers. They have endless energy, and they love fun! WORSHIP: One thing preschoolers (almost all of them) love is worship! They love singing, dancing, wiggling, and worshipping! You can sing songs all through the day, about everything! We sing songs about prayer, about praising God- about anything. Church should be a place where preschoolers love to come and have fun. 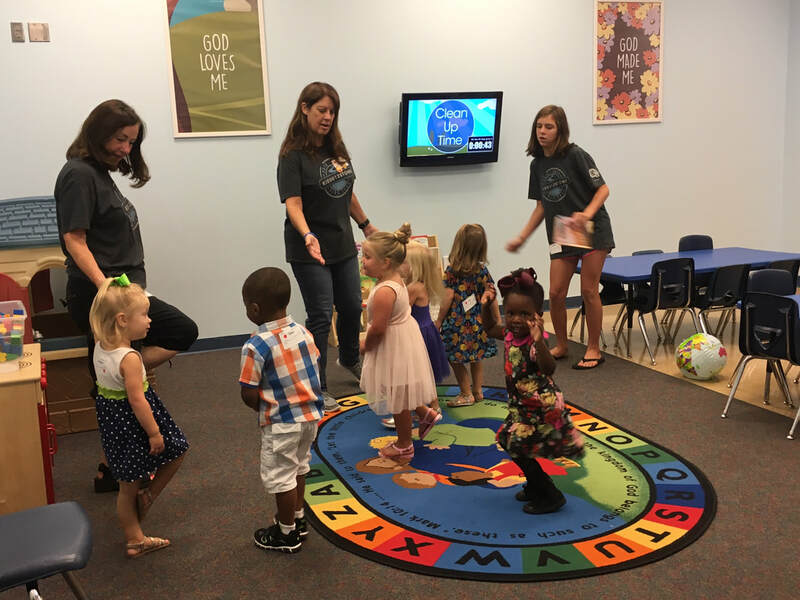 CONSISTENT LEADERS: One of the best ways to help preschoolers feel loved and safe at church is to have consistent leaders that they see week after week- people who know their names and greet them by name and notice when they aren't there. We ask our preschool leaders to serve every week. And it is amazing to see how kids connect with "their" teacher, and run to their room each week to see their special person at church who knows them and loves them. Those are 4 things I believe are important in making a preschool ministry great. What do you think are some other things that make preschool ministries great? After having our baby boy, I took a little blogging hiatus while I figured out this whole working-mom thing. And while I still don't completely have it figured out, I am getting the hang of it now, and ready to jump back into blogging. If there's one thing I've learned about new moms, especially first time moms, it's that we are crazy. We first time moms have built in protective instincts that make us crazy and want to protect our babies at all costs. I'm probably the most laid back, relaxed first time mom, and yet I still have those crazy times where all I can think about is making sure my baby is happy and healthy and safe. We need the church to come alongside us and help us, and we need to be able to attend a worship service to get ourselves filled. 1. Make sure your nursery is meticulously clean, safe, and staffed with loving volunteers. We new mamas are crazy about germs. Our nurseries are meticulously cleaned and filled with fun, age appropriate toys for babies. There are safety policies and procedures that I can count on to protect my baby. I know that the church can get ahold of me if my baby is upset or needs me. And I know that my baby will be loved and well cared for. Those are all things new mamas care about. I LOVE the feeling of walking into the nursery and hearing the nursery volunteers excited to see my baby and cuddle him and play with him. He loves going in the nursery. New mamas can go to the worship service and enjoy an hour and a half to themselves while their babies are enjoying being in the nursery. 2. A Meaningful Baby Dedication. Our Baby D is an amazing experience, and I cannot say enough how special it is to be a part of a church that gives parents the opportunity to be a part of this experience. We participated in Baby D last October, and loved being able to commit to the Lord that we would raise our baby to know the Lord and would live out the Gospel as parents. This is the first step for churches partnering with parents as spiritual leaders. 3. Give new moms a place of community. Our church focuses a lot on community in small groups. I'm a part of a couples small group with my husband and I lead a new moms small group. I love getting together with other young moms to pray, encourage each other, and grow in our faith together. New mamas especially need community with other people in the same stage of life (or further down the road). 4. Don't make church hard for us. Being a new mom is hard. One thing I love about our church is that the nursery has thought of everything. You forget to label your diaper bag? They have tags. You forgot a snack? They serve Cheerios. You need to nurse your baby? They have pagers to get ahold of you, and a nursing moms room where you can stream the service. It's hard enough being a new mom. Getting your baby to church shouldn't be stressful. The check-in and check-out process are streamlined and easy. When babies can learn that people in the nursery love them and care for them, you lay the foundation for them that church is a good and loving place, and that God is a good and loving Father. That lays the foundation in their lives to go to the preschool ministry, where they learn to worship and learn the Gospel, and that lays a foundation for them to love church in the elementary ministry and the youth ministry. It all starts with babies having a safe and loving experience in the nursery. I love that my baby loves coming to church, and I love having a church where my baby can grow up knowing he is loved. 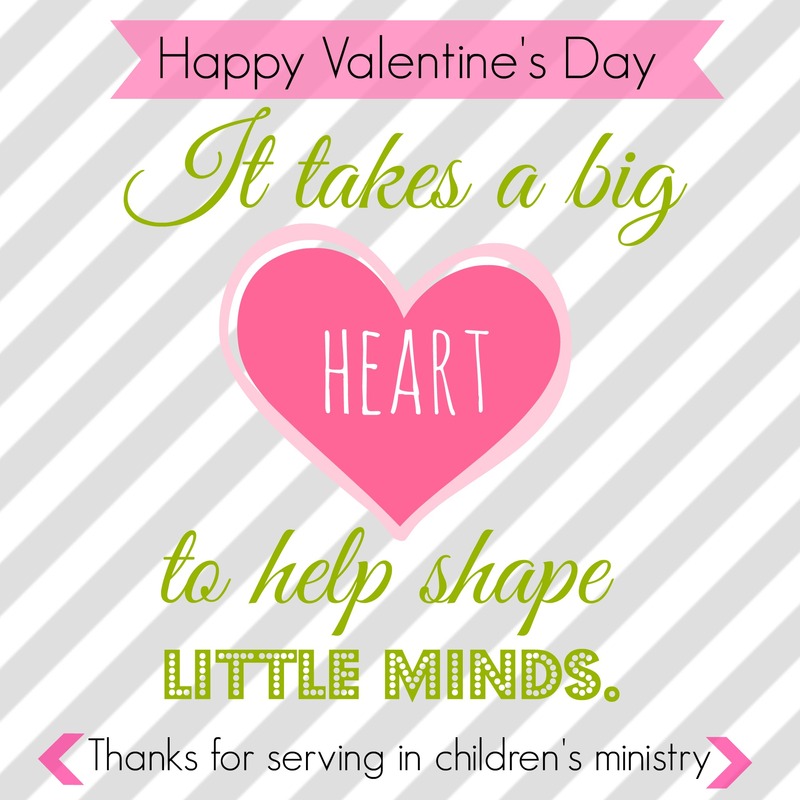 Valentine's Day is on a Sunday this year (2016), and in children's ministry, we want to make sure our volunteers feel the love! 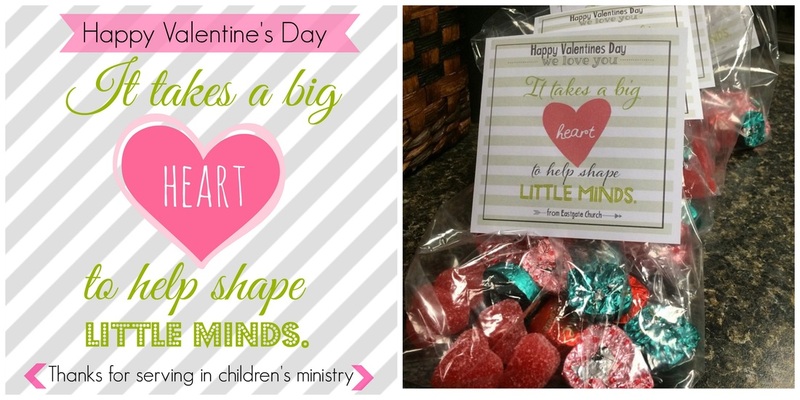 Here's a cute and easy idea I've used to show appreciation to children's ministry volunteers for Valentine's Day. I made these cute labels and attached them to bags filled with heart shaped candy. You can print the label on sticky labels and make it even easier, and just stick it onto treat bags. ​You can click the link below to download the picture to use in your children's ministry. Click HERE to download the graphic I used. In my 10+ years of full time children's ministry, I've had the privilege of working at 4 different churches, ranging from 70 people, to 700 people, to now 17,000+ people. And they are all wonderful churches, and I have loved my experience at every one of them. I don't think megachurches are better than any other sized churches. Since I have been at a megachurch for about 4 months now, I have observed some things that stand out. I'm blessed to be at 12Stone, and thankful that God provided this opportunity for me to serve, lead and grow as a part of the 12Stone team. 12Stone Church started about 25 years ago, and a few years ago, was one of the fastest growing churches in the nation, if not THE fastest growing church. 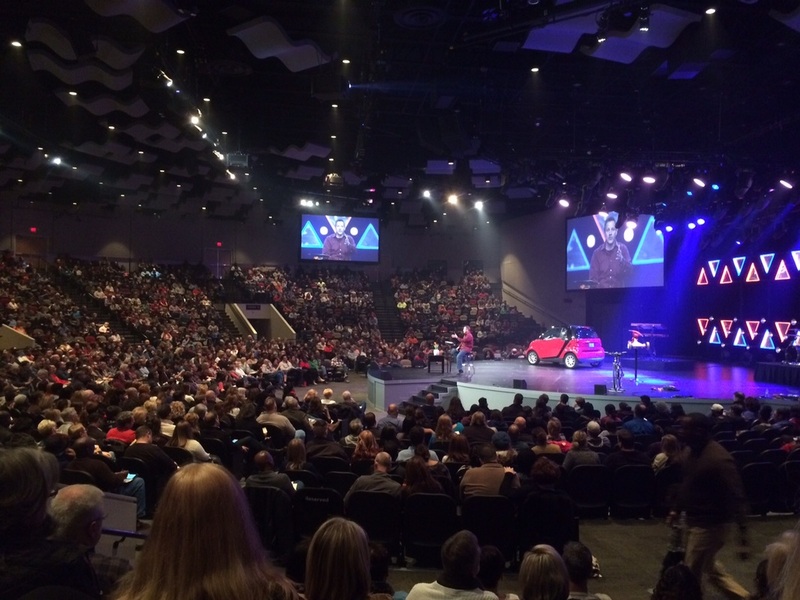 Last year, 12Stone launched 5 new campuses IN ONE DAY, bringing the total to 9 campuses. So not only is it a mega-church, but is a multi-site church with a strong focus on outreach, church-planting, and meeting and loving people as they are and giving people the opportunity to meet God and experience life change. The more I get to learn about the church, the more I love it and thank God for such a powerful Kingdom-building church. I've spent the last four months learning, asking questions and observing and soaking in the culture and values of my church, and here are some of the things I've noticed. Everyone has a specific, specialized role. In a smaller (regular-sized) church, as the children's pastor, I would be in charge of the nursery, the preschool, the children's ministry admin work, the hospitality/first impressions/guest relations, the preteen ministry, the kids music ministry, the special event ministry, the Sunday morning elementary ministry, the production/tech/worship, the special events/VBS/outreach events, the kids portion of the website and promo, and I would maybe also sometimes be the janitor and need to set up or clean up my space, as well as anything else in the church that needed to be done. In a megachurch, there's a staff person for every one of those roles. Instead of having to run all of those aspects of the children's ministry, each leader can focus specifically on a certain area of ministry, and specialize in that area. My main focus at 12Stone is the elementary ministry at our Central Campus- so I get to pour my heart into the elementary volunteers and small group leaders and pour myself into making the Sunday ministry experience amazing for elementary kids. And I absolutely love it. It's challenging, but the Lord is stretching me and teaching me as I allow Him to guide me. Relationships must be Intentional. In a smaller church, especially when you're in a ministry position, it's easy for everyone in the church to know who you are, and it's easier to make friendships and relationships in the church. This also actually makes recruiting volunteers easier, because you can easily know everyone (or almost everyone) in the entire church. Even in a church of 700 to 1000, you can know a lot of the people who attend regularly. You can find friends with whom you have a lot in common, and get to know people because you see them a lot and have chances to talk to the same people each week. In a church of 20,000, with 9 different campuses, this is not the case! Even if I know someone who attends the church, I could easily go to church every Sunday for a year, and maybe not run into them! It's harder to get to know people, and in order to make friendships and build relationships, you have to be intentional. Plus, with 4 Sunday services, people go to different services all the time, and it's harder to get to know and see and talk to the same people every week. It's not impossible- I've made some great friends- but it takes more intentionality! This is one reason small groups are so huge in megachurches. Small groups make a megachurch seem like a small, local church and make building connections easier. The myth: with so many people, you always have PLENTY of volunteers. You might think that just because you have 17,000+ people at your church, that you ALWAYS have more than enough volunteers lined up out the door ready to serve for anything needed. This is not the case. The faster the church grows, and the faster the church plants other campuses, the more volunteers you constantly need, and recruiting volunteers is a constant and intentional process. If anything, I've found it's actually easier at smaller churches, because you can easily know everyone in the church. That being said, there are a ton of amazing leaders and strong teams, and I am thankful for each of them, and it is cool to see pray for God to send the right people for the right roles, and see Him empower people to serve using their gifts. Focus on thinking large-scale ministry and thinking multi-site. Like my last point, decisions can't just be made for your ministry on your own, and apart from the rest of the church, and changes may sometimes happen that you aren't a part of or don't have a say in, and you don't always have freedom to make every change you want to make, but it takes a commitment to trusting the leadership and the vision God is giving the church as a whole, and not just focusing on your piece of the whole. When making elementary ministry decisions or curriculum choices, I have to now think of the 8 other campuses and how they will implement each aspect, and I also have to make sure the ministry is aligned with the church as a whole and the direction we are going together. One other thing is thinking more large-scale in terms of who the target is for the church, and how we relate to guests or non-Christians. In a smaller church, your target may be more narrow, and at any given Sunday, even with several visitor families, you can easily know the majority of the people at your service, and where they are spiritually, and you can target your ministry for where they are. But thinking larger scale and bigger target, with a lot more non-Christians and visitors means your ministry has to be shaped to reach those people. You can't assume everyone at church is spiritually mature, and in fact, we assume at 12Stone that people AREN'T spiritually resolved, and we aim to be a place where people who may have messy situations or aren't close with God at all can come as they are and meet Him. It's a different way of doing ministry, and I love hearing all the stories of life change each week! As a staff member, focus on teams, embracing the culture, and leadership development. In the 4 months I've been here, I've been to staff meetings to help me learn the culture and values and vision of the church, I've had meetings with a culture coach and read books written by the church leadership, and have attended a training just on learning the history, values, vision and culture of the church. There is a huge value in staff learning to ask questions and learn and grow in the church's culture, you couldn't work here and not have buy-in and not know what the church values and what it exists for. The vision is laser-focused, and it has to be. A church this size can't try to do and be everything for every ministry need. They wouldn't grow and wouldn't last long if it did! They also put value on helping the staff grow in leadership development through coaching, mentoring and growing strong leaders and strong teams. There is a very healthy staff team atmosphere, and I believe the heart for growing leaders and strong teams comes from the top down. I have deep respect for every leader above me, and trust their heart, and they trust and invest in their staff. It's a very healthy staff atmosphere, and I'm thankful to be on this great team, doing big things for the Kingdom! These are just a few of my current thoughts and observations. I'm absolutely loving my time here, and thankful for 12Stone and the children's ministry. *These are not necessarily the views of 12Stone Church. A few weeks ago, a parent from my church shared with me that their family got one of the Advent To-Go devotional boxes we gave out at Christmas-time. The boxes contained simple items that helped illustrate biblical truths, and helped facilitate discussions and devotional time for families. The parents told me that their family enjoyed the devotional time and the concept so much, that they have continued doing family devotions using simple household objects every week since Christmas, and it has re-shaped the way their family talks about their faith and does devotions together. To me- that's a huge win! My heart's passion is to see families growing in the Lord together, to see parents leading their kids, to see worship and spiritual growth happening both inside the church and outside the church! So many times, we get it wrong when we assume that church is the number one place for kids to grow spiritually; when we encourage kids to make major faith decisions at church, and get the majority of their Bible training and discipleship at church under children's ministry leaders. That's not the way God intended it to happen. 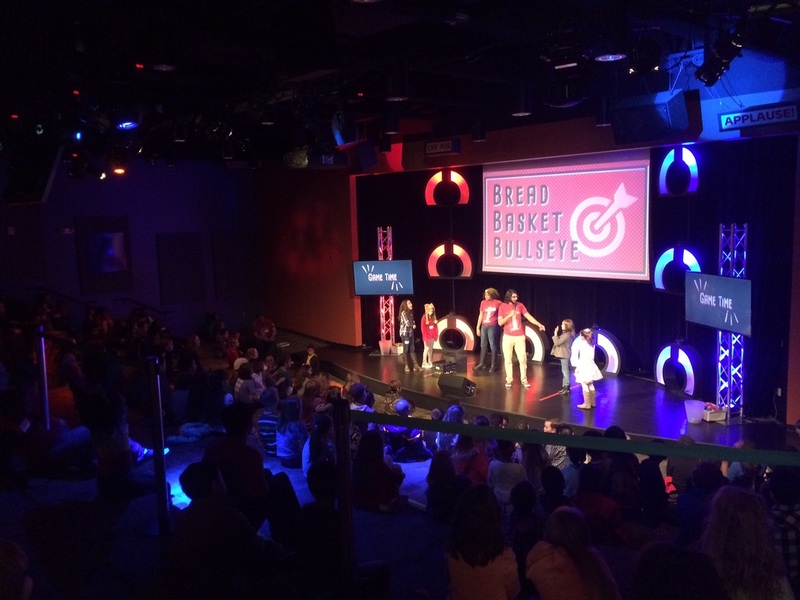 He created families to be the number one place for discipleship and spiritual growth for kids. He tasked parents with the job of raising spiritual champions. It's the church's job to help support and empower parents, and supplement what kids are already learning. The class I'm taking right now for my Masters in Ministry is all about family ministry, and it has been challenging and inspiring in so many good ways, to help me stretch and shape my views of children's ministry. I consider it a big win in children's ministry when parents and kids are worshipping, serving, learning and growing together outside the church walls, as well as in the church. Many parents are already doing a great job, but many also don't feel equipped to lead their kids spiritually, or don't feel they are doing an adequate job. It is my goal to be an encouragement and cheerleader for parents, constantly looking for ways to help them and inspire them as spiritual leaders.